How many times have you panicked when losing a file, only to remember that you’ve had it backed up the entire time? The relief that sweeps over you can only come from one of the best cloud storage sites on the web, whether you manage it yourself or pay for storage space on another company server. Backblaze is one of those companies, a site that offers you protection from catastrophic file loss and gives you the encryption you need to stay secure. If you are looking for information you might not have known before about this backup company, you came to the right spot. What Can I Do With Backblaze? What Else Do I Need To Know About Backblaze? How Secure Is The Technology Used By Backblaze? Backblaze started as a simple backup website in 2007 by a group of friends. Their goal was nothing more than to keep their files secure and backup their computers with an online server. Over a decade later, they have expanded into one of the go-to locations on the web for premium data storage. As of September 2018, they have maintained over 600 petabytes and recovered more than 30 billion files. By creating an account, you can access and backup your files from almost anywhere in the world. If you’re in front of a PC, a simple .ZIP file is created, containing everything you want to access in one download. In case you need a hard copy, they will put all of your files on a USB hard drive or flash drive and ship it directly to you. For mobile access, you can use the Backblaze app on any iOS or Android device. Now that you know the basics of their operation, you might be interested in some other pieces of data for ​Backblaze. Even with a prominent web placement like theirs, it’s important to cover some bitts about them that aren’t obvious from the outset. Setting up an account is one of the most complicated things you’ll do on their website. After creating your profile and linking your payment option, you’re almost entirely set. They don’t bludgeon you over the head with several different storage tiers for personal accounts, and you’ll always be aware of how much space you have. In just over three days, you could easily upload nearly 350 GB of data to the servers. No matter what your profession or hobby is, their company has more than enough capacity to contain everything you need to be stored on their servers. There’s no limit, either – you have unlimited access to cloud storage with Backblaze. One tiny piece of software is all you need to download to your computer, and the same simple download will get you their app on a mobile device. If you’re considering signing up for an account with them, Backblaze offers a 15-day free trial of their personal backup software. There is no obligation to stick with their pricing, and you can easily cancel through the website before the period ends. The company’s number one priority is your files’ safety and security. Their data is contained and monitored by staff at all times of day, including when you are asleep and not thinking about the placement or safety of your files. Should you wish to keep your account with Backblaze, it will convert into one of three pricing plans. For $5 per month, $50 per year, or $95 per two years, one computer will be protected against any problems. The software contained on your computer will be automatically backed up at regular intervals. If you prefer, you can manually schedule when this backup takes place. In the event of a total loss of power and/or your data, Backblaze offers the option to send a new hard drive or USB drive with every single file contained on your computer. When you receive the drive, you can do one of two things. After paying the fee, you can keep it for the future. Should you send it back to them, you will receive the money you paid for the drive, basically making this service completely free. This is an amazing perk that warrants a full recommendation of the company. Other cloud storage companies would charge extra for even installing all of your files on another drive, never mind sending it directly to your home. With the option to get your cash back after a hard drive failure, passing up a free trial and then a paid account with Backblaze seems crazy. If you own a ​business or want to look into a cloud backup for your company, Backblaze offers another plan. For $50 per computer, the advanced features of cloud storage are afforded to you and your employees. It doesn’t matter if your office uses Apple or PC – you won’t run into any other pricing tiers or data throttling during the backup process. You won’t have to worry about ransomware, either. Backblaze’s 30-day rollback feature guarantees that you can create a safe restore point for your entire company if something unfortunate happens. The same option for hard drive backups is also offered to business plans. As an administrator, the business plan from Backblaze allows you to access an interface and control what you need. All user data from each computer under your command is backed up by the software, even including desktop files that might be forgotten. For the creative types, Backblaze offers ​B2 cloud storage, a specialized archive that allows you to keep and store what you need at any point in time. It’s priced at an incredibly affordable plan, only costing half a penny for each GB per month. When you need to access your data, you can download it again at one penny per GB. Do you have analog recordings that you are converting to digital format? Are you creating apps that need storage space after a while? Consider the B2 plan from Backblaze. This will make your life easier and allow you to devote more time to developing your new concept. The security of your files can never be taken for granted in today’s world. It doesn’t matter who you are – a random IP address from across the globe could be waiting for the perfect opportunity to swipe your information and use it against you. Thanks to the airtight security used by Backblaze, you can rest easy. The simple process of storing your data already involves encryption, thanks to the software used for backing up your files. Your data is already encrypted on your local computer, and they are transferred over a secured connection when they move to the storage servers at Backblaze. If it sounds complicated, you’re not wrong. This company uses a combination of publicly-known and industry-protected security protocols. As soon as you create your account with Backblaze, your security is already established with a unique key. After your data is transferred, you are given a unique data storage area inside their cloud storage hub. You will then be able to access anything you need with your login credentials. Two-factor authentication is now a standard process everywhere, and Backblaze is no exception. As soon as you sign in, a 6-digit number will be sent to your mobile device for login confirmation. Once you have been verified, you can begin a restoration process if necessary. You’ll do this through a secure website, separate from the software used on your local machine. 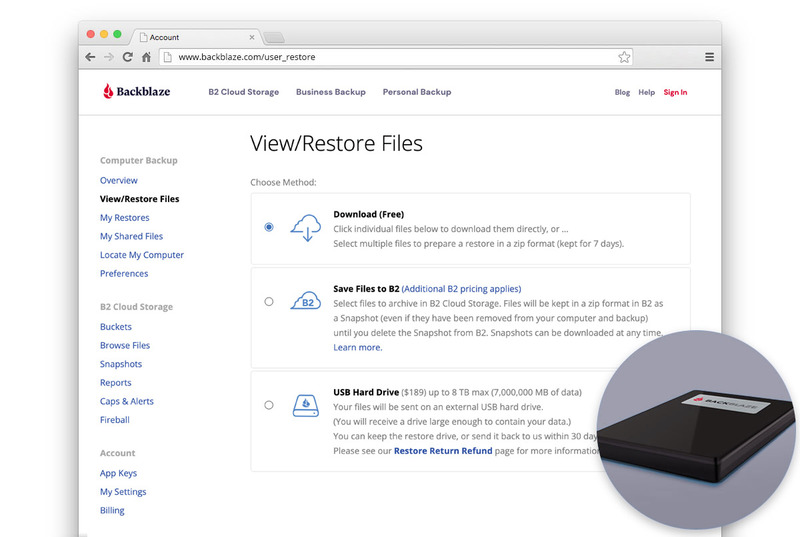 When a data restore is requested, Backblaze does all the work needed. You can sit back and relax as they decrypt everything you have sent them and place your files inside a newly-created .ZIP folder. The whole process is done outside of the website, preventing anyone from accessing the information. This new collection is sent back over the secure website and directly to your computer. Thanks to their open policies, Backblaze is an excellent choice when searching for a place to keep your personal data secure. Whether you are an executive who creates marketing ventures for a billion-dollar company or a guitarist who plans to convert all your recordings to a digital format, Backblaze has something to offer. Reading about the various options available to you through Backblaze should help you decide whether the company has the necessary products for you. Running a business doesn’t have to keep you up at night while you stress over the location of important files. Even if you lose everything, this is a company who goes out of their way to load everything to a piece of physical media for your personal use. That kind of customer service is what will keep you interested in a company like Backblaze. There are many other competitors out there for anyone who needs cloud storage, but it isn’t often that you can directly attach a face to those who keep your information safe.